If you’re wondering about a unique gift that you can give someone instead of flowers, consider flower seeds. Flower seeds can be a fun replacement to the standard bouquet of roses or other flowers, because they have the potential to be a gift that keeps giving. Long after cut flowers would have died, flower seeds can provide beauty and fragrance for a room or garden because they turn into a living plant. Giving a gift of flower seeds can show love, friendship, or endearment on a long-term basis by offering the recipient a constant reminder of your thoughts. 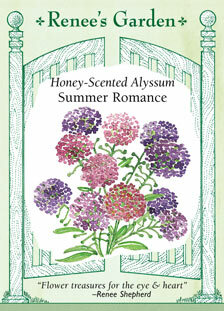 This flower seed mix includes fast-growing, honey-scented blossoms for a garden or pot. It features a combination of seeds for growing beautiful lavender, violet, rose pink, and white flowers that attract butterflies. “Love in a Mist” will give your intended the gift of feathery foliage for a dreamy atmospheric effect. Light and wispy blooms in jewel tones like sapphire, quartz, and amethyst offer even more seeds to dry and plant. For a unique gift, give a “Thanks a Bunch” greeting card made out of plantable seed paper. These cards are stylish and earth friendly. They’re embedded with annual and perennial wildflower seeds and they come with 100%-recycled envelopes. If you want to give the gift of flower seeds for a special occasion, or to offer sympathy, there are many companies you can turn to online like the few we’ve mentioned. You can buy flower seed packets, cards, and even plantable novelty items, such as seed bombs, that can serve as a message of your kindness for a long time to come. It’s possible to buy seeds to grow roses, bachelor buttons, sunflowers, zinnias, and many other gorgeous flowers. Consider this special and thoughtful gift the next time flowers seem in order. If you’re wondering about a unique gift that you can give someone instead of flowers, consider flower seeds. Flower seeds can be a fun replacement to the standard bouquet of roses or other flowers, because they have the potential to be a gift that keeps giving.Long after cut flowers would have died, flower seeds can provide beauty and fragrance for a room or garden because they turn into a living plant. Giving a gift of flower seeds can show love, friendship, or endearment on a long-term basis by offering the recipient a constant reminder of your thoughts.